Considering the interest in this topic and the fact that general worldwide keys are written in papers (and sometimes in languages) difficultly reachable, I insert an user-friendly figured version of Breuning's keys. This part allows identifying the tribes. Clicking on the name of each tribe, it is possible to have access to the gallery in order to verify the identification. In the near future, I insert the key to the genera, starting from the tribes poorest in genera. Naturally, this system shows some problems, e.g. the wingless tribes are probably polyphyletic; nonetheless, this is the best system used until today. Some taxonomists recently suggested different groupings (for example: Monochamini, Obereini, Phytoecini, etc,) nonetheless, evidencing contradictory characters and writing any monographs or lists of species. The species of this group are characterised by hind wings reduced or lacking. The insect is unable to fly. The elytra are fused or better, stuck together. The surface is often ridged, covered with granules and/or spines. The colour is often black or brown, reminding the soil. The metasternum is very short. The species of these tribes are - obviously - among the most evolved of the Lamiinae, though Breuning (and other taxonomists as well) inserted them at the beginning of the lists. This only for reasons of simplicity. The proposed tribes are probably polyphyletic and new groupings deserve the comparison of many genera and possibly, the introduction of new taxonomic characters. The species of this group are characterised by a cicatrix, that is a ridge or some evident granules on the apex of the scape (first article of the antennae). In this case as well, the species are more evolved that the following groups but they are inserted here since the character is easy to be detected. This group is carachterised by widened metepisterna. 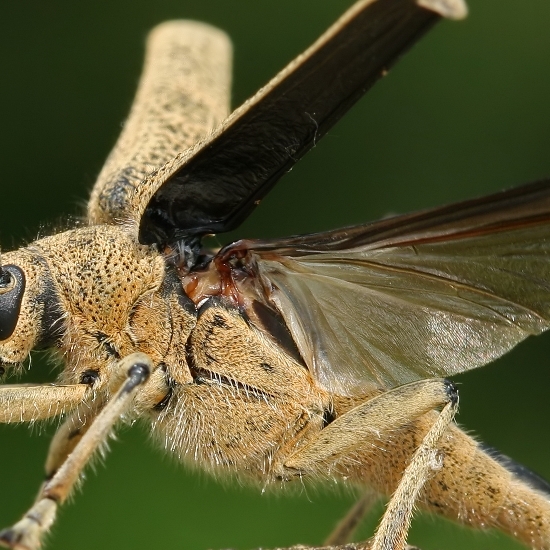 Notice that the metepisternum (the area between the hind legs under the hind wings) is triangular and not parallel-sided as in other cerambycids. This group, in all likelihood monophyletic, is among the most primitive branches of Lamiinae. This groups is carachterised by claws of tarsi scarcely open. It is about the same character that it is possible to find in nearly all other subfamilies and families of Cerambycoidea. Being a primitive character, the tribes of this group are the most primitive among the Lamiinae. Notice that the group 3 and some taxa of the groups 1 and 2 have this kind of claws. They must be searched in the respective groups. This groups is carachterised by claws of tarsi widely open. This character is almost typical of Lamiinae, but can be also found in other families of tree-climber Beetles. The species are rather evolved among the other Lamiinae. Notice that many taxa of the groups 1 and 2 have this kind of claws. They must be searched in the respective groups.